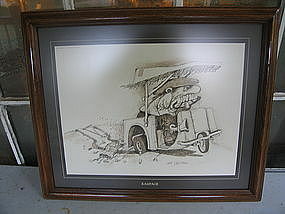 The Fairway print is from the Thought Factory and dated 1976. The frame is 22 x 18 inches and the print 16 1/2 x 12 3/4 inches. 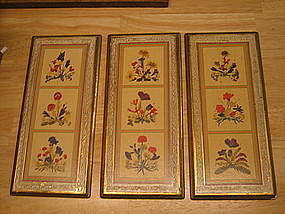 The frame has scratches and damage from poor storage. Additional photos by email. I need your zip code to calculate the postage. 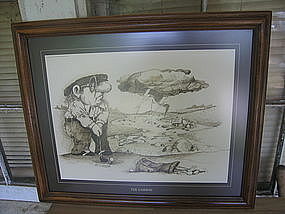 Professionally framed and matted 1975 Thought Factory print. All materials used in this picture seem to have been a good quality.The frame measures 22 x 18 and print viewed print is 16 1/2 x 12 3/4 inches. The frame has superficial scratches. Complete condition photos by email. Several prints in this series are available in similar style. I need your zip code to calculate the postage. 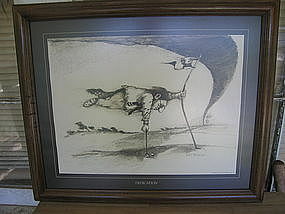 1975 Thought Factory print, professionally framed and matted. Very nice quality materials were used in the piece. The frame is 22 x 18 inches and the viewed print is 16 1/2 x 12 3/4 inches. There are scratches to the frame. Additional photos by email. I need your zip code to calculate the postage. 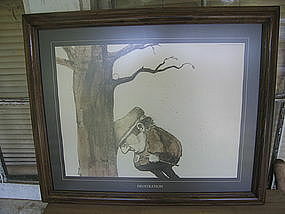 This is a nice quality professionally framed print from the Thought Factory and dated 1976. 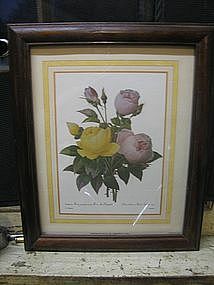 The wooden frame measures 22 x 18 inches and the visible print measures 16 1/2 x 12 3/4 inches. 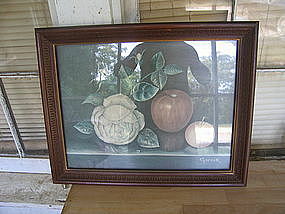 The print, frame and glass have no damage, other than some scratches to the frame. I have additional photographs available by email. There are other prints in this series in the same size and frame available for purchase. I need your zip code to calculate the postage. 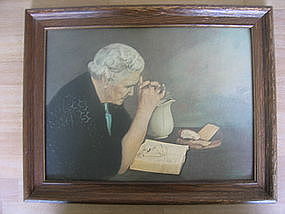 Vintage wooden picture frame measuring 9 x 7 x 1 inches. There is no structural damage, but there is wear to the finish, as well as some oxidation to the metallic trim on the inner rim. Additional photos, including one of the back, which is very unusual, available by email. I need your zip code to calculate the postage. There is no frame. It measures 4 x 3 1/4 inches. There is minor wear and the back piece has some soiling. Additional pictures are available. 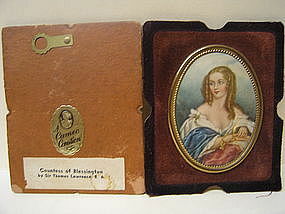 Countess Blessington is also available and priced individually. I need your zip code to calculate the postage. This set does not have a frame. The exterior measurements are 4 x 3 1/4 inches. There is no damage - a bit of age wear and the back piece has some soiling. 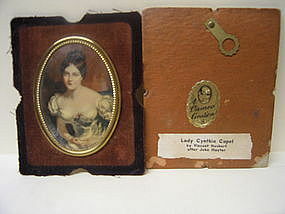 Lady Cynthia Capel is also available and priced individually. Additional photos by email. 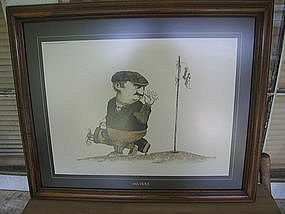 Marked as Litho U.S.A. Bernard Picture Co., Inc., 1990. 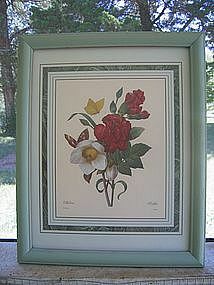 The frame measures 11 3/4 x 9 3/4 inches and the print is 7 1/4 x 5 1/2 inches. 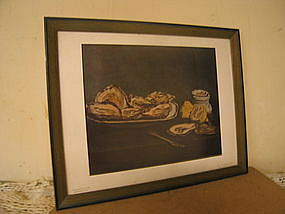 There is no damage to the print or glass, but there are some superficial marks to the frame. 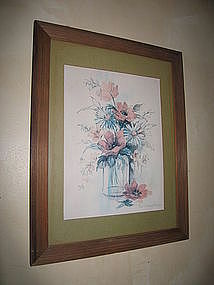 Although, there is nothing wrong with this sturdy wooden frame, it is not very complimentary to the delicate print. 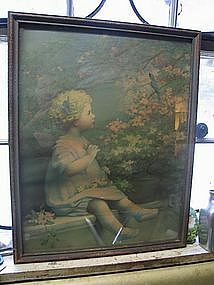 The frame could be repainted in a more pleasing color or replace the frame altogether. I need your zip code to calculate the postage. 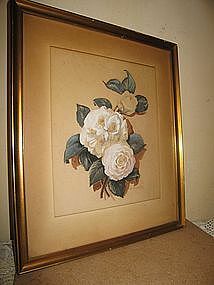 Vintage framed print measuring 17 x 14 3/4 inches (the measurements includes the print and matting). I have seen new prints given an "antiquing" treatment, but only age can give this effect. I do not know the date on this print and not been able to find any information on the artist. 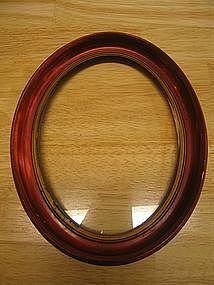 There are some small rips to the sealing paper and wear the finish of the frame. Complete condition photos by email. I need your zip code to calculate the postage. Framed, the measurements are 18 x 14 inches. 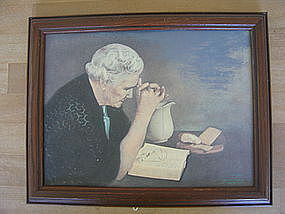 There is some wear to the frame, as well as age related yellowing to the matting. The workmanship to the frame is outstanding. Complete condition photos by email. I need your zip code to calculate the postage.